Duck Rings are the climbers version of traditional gymnastic rings. 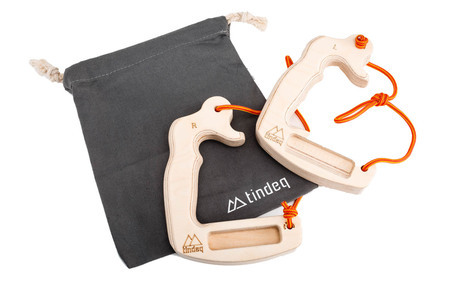 Designed to provide a compact, lightweight and stable means of rock and alpine climbing specific training. Duck Rings are designed with a variety of grip choices allowing you to train almost any grip position you would use when climbing on real rock. 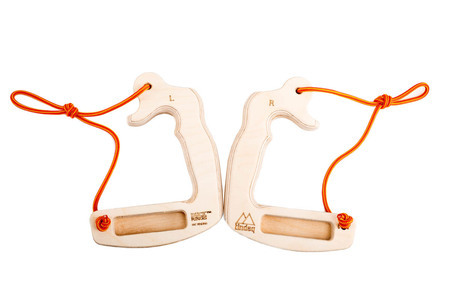 Duck Rings weigh only 285 grams for a pair, yet it has the functionality of a hangboard. Perfect for to bring when on travel or as a warm-up tool on the crag. Every pair of Duck Rings is made out of high quality plywood and which gives a unique natural wood look. 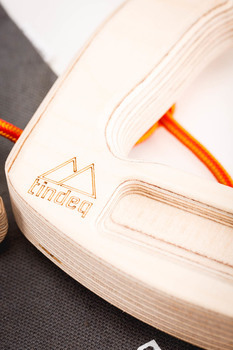 The wood will even absorb moisture from the hands while exercising, eliminating the use of climbing chalk. We think this is a great idea. Training rings with all the functionality of a fingerboard, but lighter and more portable. They also function as rings to allow core training exercises and warm up routines. The high-quality, ergonomic, plywood construction feels great and wont wreck the skin on your fingertips.